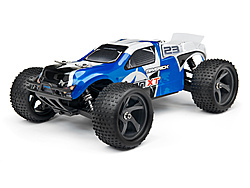 The Ion XT is the perfect little truggy racer that can take the fight straight to the competition! Whether you're a racer or just want to play with something a bit more sporty, the Ion XT is going to be a great choice for fun and speed! The Ion XT is fully equipped with a fast 370-size motor, NiMH battery pack and 2.4GHz transmitter to let you simply plug and play whenever you feel the urge to drive. It's also got a strong 4WD shaft drivetrain, durable suspension parts and 4 oil-filled shocks that give you total control and reliability!